The short answer is … it probably can. The circumstances surrounding the Montreal EXPOS relocation to Washington D.C. are complex and controversial. If you are interested in reading about it, check out this 2004 Washington Post article by Steve Fainaru. The upshot is an entity formed by Major League Baseball took control of the EXPOS franchise, including its trademarks, and has maintained those marks ever since. 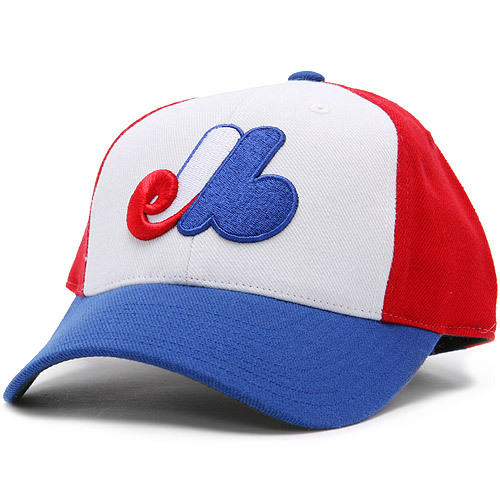 The EXPOS name and logos remain active and currently registered U.S. trademarks (in Canada too) and products bearing the brand are available from MLB or its licensees. There is precedence for a professional sports team to relocate and reappear under its original name (with a new ownership group). In a move equally as controversial and perhaps more contentious than the EXPOS relocation, the NFL’s Cleveland BROWNS left for Baltimore in 1996 and became the RAVENS. The City of Cleveland sued to stop the move. Ultimately, it wasn’t able to keep the franchise but it did retain the Cleveland BROWNS trademarks and legacy. Three years later the Cleveland BROWNS were “reactivated” as an expansion team. A review of the U.S. Patent & Trademark Office (USPTO) database shows how the trademarks were transferred. The Baltimore RAVENS assigned the Cleveland BROWNS trademarks to a trust naming NFL Commissioner Paul Tagliabue as trustee, who then transferred the marks to the new BROWNS franchise. The chain is important because it tracks ownership and assignment of all right, title and interest in a mark, including priority of use and goodwill, the sine qua non of any trademark transfer. A transfer of a mark without the underlying goodwill is an “assignment in gross” (or invalid transfer) and can result in a loss of rights. See 15 U.S.C. § 1060. For a professional sports franchise, goodwill derives from a team’s name, logos, colors, players, personnel, history, wins, losses, championships, banners, trophies, retired jerseys, club/player statistics, records and any other distinctions and memorabilia … all of which creates fans and loyalty and an intangible asset that isn’t easily quantified or forgotten when a team abandons a city. Typically, the trademark follows the franchise – when it relocates, the name and history remain intact. The Brooklyn DODGERS are now the Los Angeles DODGERS and they honor and recognize their Brooklyn heritage as part of the DODGERS franchise (BROOKLYN DODGERS is a registered trademark owned by the L.A. DODGERS franchise). However, keeping a prior city’s nickname can lead to some incongruous team names. For example: Los Angeles LAKERS, originally from Minneapolis, Minnesota, the land of 10,000 lakes, is an odd nickname for a team in Los Angeles, California, currently in the midst of the worst drought in state history. Utah JAZZ — initially from New Orleans, the birthplace of jazz — is another example. (2) so the original city and team fans can keep the goodwill and preserve the name should a team come back. 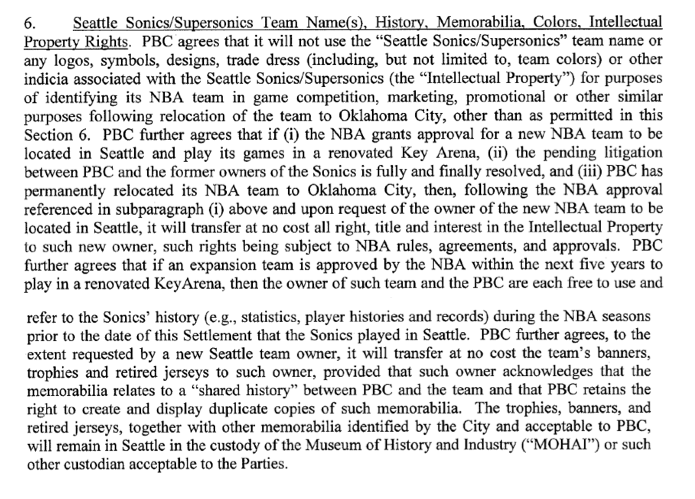 Preserve the name is precisely what the city of Seattle, Washington has tried to do with the SONICS/SUPERSONICS trademarks. Note that the agreement would require both franchises to acknowledge a “shared history” and the THUNDER retain the right to create and display duplicate copies of “memorabilia.” While they technically don’t own the EXPOS trademarks, the Washington NATIONALS also acknowledge their Canadian roots and shared history. Before the All-Star Game this summer, MLB announced the results of its “Franchise Four” competition, in which fans selected the four “most impactful players who best represented the history of each franchise.” The four winners and seven of the eight finalists for the NATIONALS were EXPOS. The franchise structure of North American professional sports leagues allows teams to share a history without necessarily owning the associated marks or goodwill; and extensive licensing and merchandising programs help keep seemingly abandoned team names alive and well and available for revival. So there is hope Montreal, not just for the return of a major league baseball club, but hope that the EXPOS can go home again. ← The Parody Defense is Dead. Long Live The Parody Defense!